The Constitution of Sri Lanka, which had undergone 18 amendments earlier, was amended for the 19th time during the 100 day interim government period under the Premiership of Mr. Ranil Wickremesinghe. Mr. Wickremesinghe’s party, the UNP, was a minority party in the Parliament at the time. 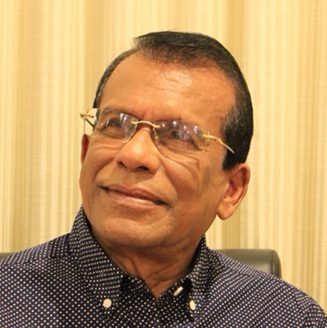 The majority required for the amendment of the Constitution was secured with the help of President Maithripala Sirisena. 2. Limitation of the President’s term of office from 6 to 5 years and the disqualification to contest a Presidential election after two terms of office as President. 5. Replacement of Chapter viii of the Constitution( dealing with the Cabinet of Ministers under the EXECUTIVE )by a new chapter viii. More attention is focused in the current context on the replaced section of the 19th amendment dealing with the Executive and the Cabinet of Ministers. 43(1) President shall , in consultation with the PM, where he considers such consultation to be necessary, determine the number of Ministers and the assignment of subjects and functions to such Ministers. Then it falls within the Powers of the President to appoint a new PM who he thinks has the likelihood of commanding the confidence of the Parliament. The question of majority does not arise here as in Jan 2015 the President appointed RW as PM when he did not have a majority but the President opined that he would command the confidence of the parliament. This was confirmed correct since there was no no confidence against that PM by the than parliament. Section 43(2) of the Old constitution states, “notwithstanding the dissolution of the cabinet of Ministers, the President shall continue in office”. This provision has been removed under the amendment. The right of the President to appoint Ministers from among the MPs has been curtailed. According to section 43(1) of the amended constitution it is the President who determines the number of Ministers of the Cabinet of Ministers and the Ministries and the assignment of subjects and functions to such Ministers in consultation with the PM where he considers such consultation to be necessary. But according to new article 43(2) “ President shall on the advice of the PM, appoint from among members of Parliament, Ministers to be in charge of the Ministries so determined. The selection of the individual MPs for such positions falls within the purview of the PM since it is only on his advice that the President can give the appointment. 46(1) a) and b) limits the Total number of Cabinet Ministers not to exceed 30 and the deputies not to exceed 40. The provision under subsection a) of the OLD one dealing with the PM ceasing to hold office due to a removal under the Hand of the President has been dropped in the amendment. Section 47, of the old Constitution dealt exclusively with the tenure of office of the Prime Minister, Ministers and Deputy Ministers and specifically referred to 3 circumstances under which they will not be able to continue holding of office. They are a)removal by writing under the hand of the President, b) resignation, and c) ceasing to be a Member of Parliament. Whereas 46(2) of the new constitution specify only two applicable circumstances, as applicable to PM ceasing to hold office, viz. resignation and ceasing to be a Member of Parliament. According to this amended provision the power for the President to remove the PM by a letter issued under his signature has been dropped and the Power the President had to remove a Minister has been curtailed with a rider that it can be done only with the advice of the PM. As to why such provisions ,one limiting the right of the President to remove a Minister and the other taking away the right of the President to remove the PM , became so important is a big question. In the context of the dilemma today we can presume that the constitutional wizards have foreseen the need to include such extraordinary provisions. There appears to be an unexplainable ambiguity here because even under the new constitution, elsewhere in articles 47(2) and 47 (3) the right to remove the PM, any Minister or a Deputy Minister remains with the President ( except under 46(3) a) where it can be done only under the advice of the PM . Dissolution of the Cabinet of Ministers comes under 48(1) of the new constitution. There it states, “On the PM ceasing to hold office by Death, resignation or otherwise ……..the Cabinet of Ministers……. shall stand dissolved and the President shall appoint a PM , Ministers and Deputy Ministers, in terms of articles 42 , 43 and 45. Here there is another ambiguity seen due to a difference (a remarkable one in the current context) between the amended Sinhala version and the English. The Sinhala version consist of the removal of the PM as one reason for PM’s office to fall vacant whereas the English version omits this and confines it to two reasons only namely death and resignation while another strange additional provision is included as “otherwise” among the reasons. Now whether the removal of the PM under his hand can be considered as a matter coming under this “otherwise” is leading to confusion. But according to the Law where there is a difference between Tamil and Sinhala, the Sinhala should prevail. Hence article 48(1) ( Sinhala version)can be considered as providing an unfettered Power for the President to remove the PM. Another discrepancy between the English and Sinhala versions of the new article 48(1) is that “ Death” as a reason for the PM to cease hold office is appearing only in the English version. So it appears that the reason “otherwise” has been introduced deliberately to deal with such discrepancies. It is intriguing why a new constitution provided for a reason to be falling within an undefined “otherwise” leading to interpretations when the old constitution was more specific and did not contain such ambiguities! Section 49 of the amended constitution deals with Transitional Provisions and specifically refer to applicability of the amended provisions of the constitution to the PM and the President. There is an anomalous situation arising out of this transitional provision. According to section 49 the President has to continue to hold office only under the provisions of the amended Act whereby his Term of Office gets curtailed to 5 years. He was however elected to office by the voters exercising their franchise under the constitution that prevailed then for a term of office of 6 years. By this transitional provision the period gets reduced to 5 years. There appears to be an infringement of the rights of the People who voted him for a 6 year period due to this. A fundamental issue dealing with the sovereignty of the people should have been the subject for a determination by the people at a referendum. The inclusion of the Prime Minister under the transitional provisions does not appear to be of any importance since the PM s term was limited to that interim parliament scheduled to be dissolved at the end of 100 days. This question is relevant because it is only the period of the term of the President that goes beyond the dissolved parliament and extends to the period of the new parliament. Whereas it is not so in the case of the PM who in any event goes out with the dissolution and the new parliament will have a new PM appointed under the provisions of the 19th amendment. No special transitional arrangement becomes necessary for the PM. Therefore the hurriedly amended constitution appears to have brought serious limitations of the Presidential powers in an unexpected manner. The crisis arisen now in the country and the concerns expressed regarding the continuity of the National Government by the constituent parties has created a dilemma under which Public would be interested to know many things. I do not think President is prepared to remove the PM. There are invisible hands operating to make sure that Ranil is kept as PM. Do you think the forces operating behind the ‘Regime Change’ project will allow the President to remove Ranil. Ranil is their poodle. He does everything that they want. My guess is that these forces would have forced the President to continue with the ‘Jathika/Awajathaka Aanduwa’ keeping Ranil as PM. Another matter for concern is discrepancies the writer has pointed out in English and Sinhala versions. But as he says “… according to the Law where there is a difference between Tamil and Sinhala, the Sinhala should prevail. Hence article 48(1) ( Sinhala version) can be considered as providing an unfettered Power for the President to remove the PM.” I wonder whether this is a blessing in disguise if the President is determined to remove the PM. The cunning foxes who drafted the 19th Amendment would have foreseen possible situations and prepared the English version but may not have checked the Sinhala version. Thanks for the very informative article. Could you spare a minute to explain us the Constitutional definition of ” National Government” for the purpose of increasing the number of Ministers beyond 30. It is supposed to be based on an ‘agreement’ signed between two political parties. This agreement is formalised at what stage? Is it presented to the parliament for debate and voting similar to a bill? If 30 is decided on the basis of sufficient number for functional purposes what justification does the constitution provide for increasing the number? Does our Constitution so unabashedly and brazenly stipulate somewhere that benefits to MPs/political parties overrides the functional requirements? The number of cabinet ministers and deputies etc will be decided by the parliament and no maximum! What the parliament does in such a situation is violating the constitution section 46(1) which limits the ministers to 30 and deputies to 40! What a clever crafty arrangement!!!! Constitution of a country is meant to protect the fundamental rights of every citizen. As long as the lawmakers work towards this ideal, we are OK.
RT thanks for the explanation. There is a dire need to eradicate corruption and elements associated with them, which should go beyond the technicality of Constitution. Hope President will not abuse his executive tail make a mess of it. IT looks the 19th amendment is garbage, just pile of paper without any value. I heard, the PResident has not signed this or gazetted.. On the other hand, PResident can stay six years. I fnot people can challenge the courts for saying not. further to that, PM should not exist if the PResident re appointe dhim again. That part is really confusing. I don’t know what they impartial Judges would decide. If the wording is complete, President is just puppet and the PM is really powerful. PResident cannot remove even the PM or a minister without asking him. So, My question is how come Shaymon Jayasinghe, and one Gamini Jayaweera blames UPFA and Presient for blunders of Ranil the PM. why no one is talking. In a proper Court case Ranil should be doomed if not the 19th amendment should be nullified as invalid because of so many errors. I also do not know why PResident is holding. He is giving so many excuses in various ways. but nothing holds valid. It is poosible both Ranil and Maithripala Sirisena invovled in the scam during the days of the SLFP govt, I mean those employees were there to expose it and Yahapalanaya fired them as soon as found it. Not related to that, Ranil lost paertly because he paid TNA 20 million and HE paid Foot NOTE gang %0 million – one billion. People know it.